Reading's John Mackie has been handed a three-match ban after he admitted to making racist comments following a game against Sheffield United in December. 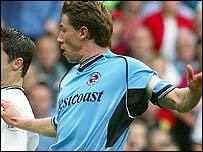 Mackie will start the ban on 17 March, with another five-match ban suspended until the end of the 2003-04 season. "In the event of a similar incident before that date, this additional suspension would be activated with immediate effect," an FA spokesman told the FA's official website. In addition, Mackie was fined £1500, with another £1500 suspended until the end of next season. Mackie's abuse was directed at Carl Asaba during the game on 14 December and, although the Blades player did not want to take the complaint further, his club took it to the FA. The Royals defender publicly apologised after the game and voluntarily donated two weeks' wages to the Kick Racism Out of Football campaign. "The FA have taken a strong line"
"I deeply regret the comments"